Intense music. A person has their back turned. Wanting to reach out is the natural response. But, something doesn’t feel quite right. It just feels...off. Realization hits, there is a body at the persons feet. The body has blood on it's side, some on it's face and arms...all the wounds look like...bite marks? Too small to be an animal. Human? The person turns around, only, it's not a person. Not any more. It has blood dripping from it's mouth. Torn clothing and cuts on it's arm that are oozing black gunk. And, is that a finger in it's hand? Are you going to survive the Zombie Apocalypse? Maybe you could pull a Bill Murray and pretend to be one of them. Hide from the undead horde with expert make up and acting skills. 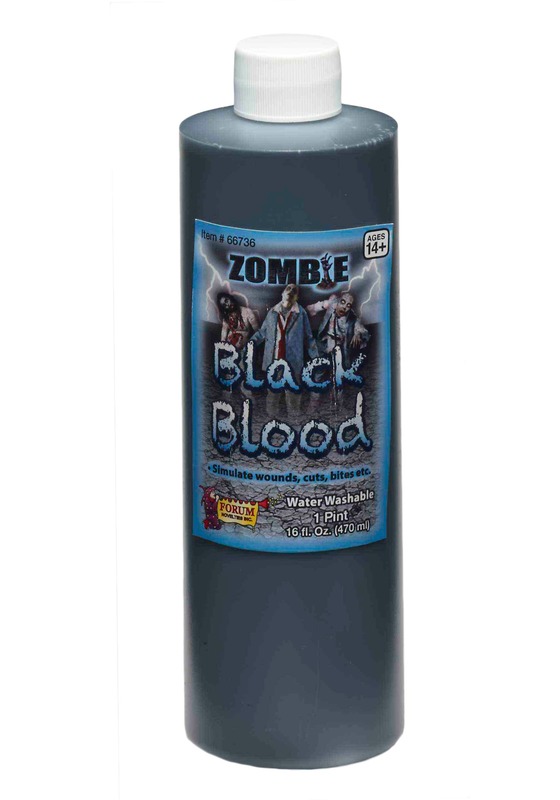 Just apply a little of this Zombie Black Blood, get some ripped up clothes, and you are well on your way to being one of them. Now, all you'll have to do is learn to walk like them, a jerking limping motion. Arms reaching for your next victim. Don’t forget the moaning. Uhhhh! Standard Capacity 16 oz. 16 oz.